Using the Martha Stewart craft knife... ignore the mess behind me ! Are you ready to spook tonight .... are the kids on a sugar high if you are in another time zone... We are decorating here at The Rubber Cafe for our spooky trick or treaters ... I just hope that we get some ... we live on a huge hill so we will see . I am ready and well prepared and if they do not come I am going to have a lot of candy to send to the food bank. I can not keep candy in this house because I LOVE IT way too much . So last night we had a BYOP (bring your own pumpkin) there were snacks and treats and of course pumpkins. The first part of our journey started with trying to find pumpkins as the stores were sold out . Thank goodness for the pumpkin patch we found . I had some real pumpkin artists at my house last night ... I was put to shame ... I was cutting my Frakenstein and his face popped out so he is pinned back together and the other I did was the dog howling ... 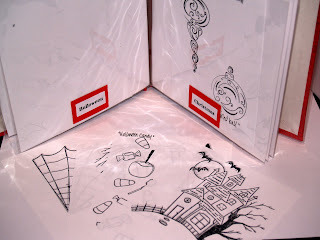 I did these with the CRICUT Fall Collection Cartridge and Crafters Companion Stick and Spray and a Dremel. On the Skull Pirate he was done completely with the Dremel I think that Anna really rocked this pumpkin. 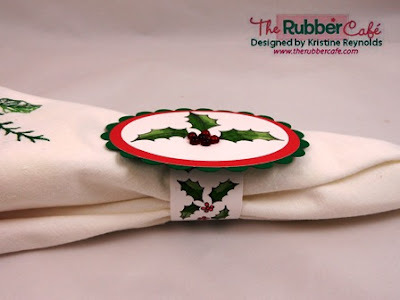 This week our challenge from Melissa was to make place settings for the holidays! Right away I knew I wanted to use the fabulous new set; Ornamental Holiday! I have white dishes and paird them up with a champagne table cloth. My accent colors are burgundy and black with a touch of Liquid Platinum embossing powder. For my menu I used Nestibilities Labels Four dies. 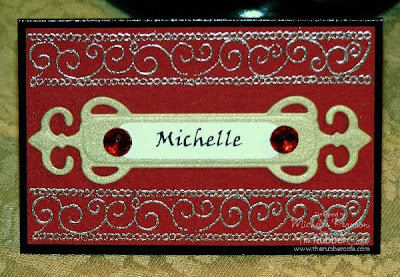 I embossed the border from the Ornamental Holiday set across the top and bottom of my burgandy panel. Hint: My black cardstock is glossy, so use a black ink pad around the edges to make the white disappear. For my napkin ring, I stamped the same border end to end and then a row of the Brused Border end to end. Below that another row of the Ornamental Holiday border. Attach your ring together with One And Only Tape. It looks beautiful with a few red gems! 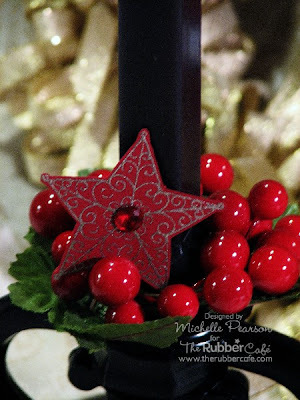 For my centerpiece, I decided on black candles and candle holders with little red berry rings. I embossed and cut out the star ornament from the Ornamental Holiday set, added a gem in the middle and added it to the mix. I also decided to do charms for the glasses. I'm only showing one here, but to vary the design you could use the star, heart and ornament images and varying colored gems and pearls. I attached my charm with sheer ribbon to a wedding ring that I colored with a metallic paint pen to coordinate better. Hint: Rings found in wedding department at Michaels. 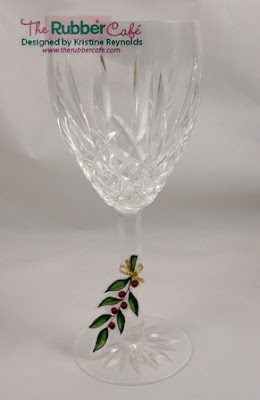 They bend easily to wrap around your stemware. 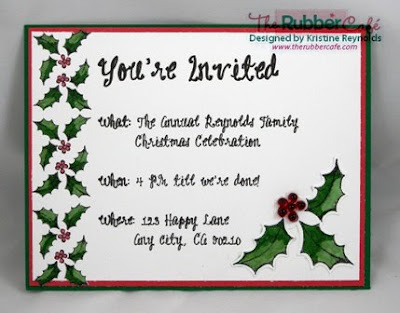 Finally I designed an invite using the various images in the Ornamental Holiday set. I melted a gold ribbon for a tiny bow to hold up my heart ornament. The coordinating wreath in the background was made by tying coordinating ribbons in bows on a metal ring. 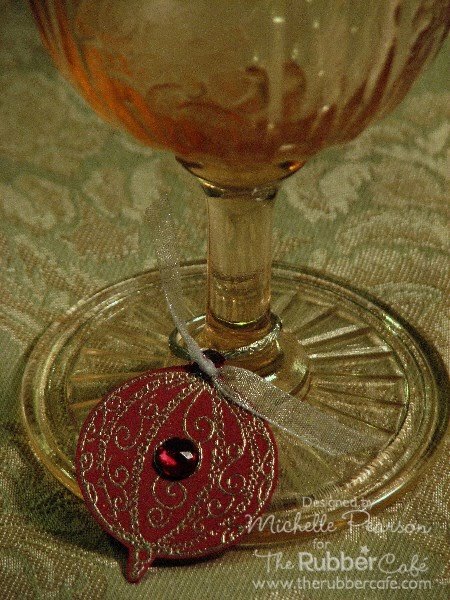 It makes a beautifully festive addition to this place setting. I have loved seeing the other DT member's take on this challenge! 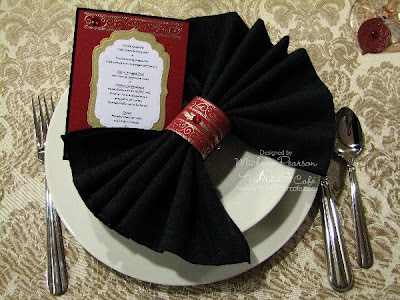 I hope you have gathered some fun ideas to give your next family gathering a special touch! Happy Saturday!!! 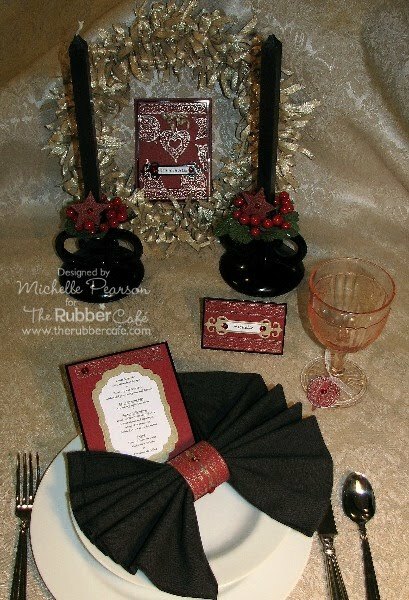 I have another fun table setting for you today and I am using some super fun fall elements from The Rubber Cafe for a Thanksgiving Table. I created napkin rings, place cards and drink coasters using a huge amount of goodies that you will find online. For the napkin rings I used the stamp Indian Corn and colored with my copics. The coasters were sponged and then I used the stamp called Large Grape Leaf in four fall shades of ink. I actually stamped right over each other because the blended colors looked very pretty. Then in the center with Rich Cocoa ink I stamped the image Give Thanks. Then my last item to share with you are my place cards for which I used the set Card Labels and the image called Large Herbal Leaf. I simply stamped my label, cut it out then with a light ink I stamped the Herbal Leaf image in the center. Then I just created alittle tab on the back for them to stand up. Hope you are enjoying the Table Settings Theme this week. I know my DT Sistahs are SUPER talented and will BLOW me away with their creations!!! I have been busy playing with one of the newest Christmas sets from The Rubber Cafe, "Christmas Tidings". When I saw it I knew it would be perfect for holiday table projects. Here are a few things I've come up with so far. Your friends and family will love receiving an invitation to your festive dinner. Imagine how surprised they'll be when they get to your house and see that your beautiful table matches their beautiful invitation! 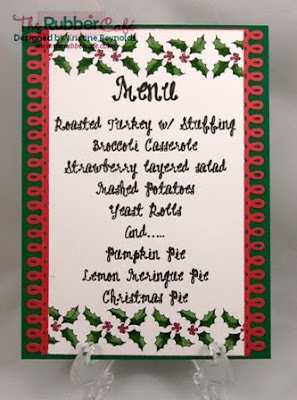 A fancy menu is a great way to add festivness to your holday table. Here's a close up look at the placecard. Here is a close up of the napkin holder. I just happen to have the perfect napkins that match! For a great way for your guests to tell their wine glasses apart color the leaf different colors and use different jelly Dots for the "berries". 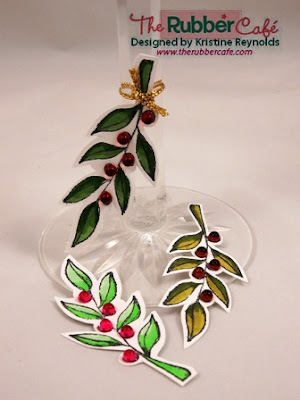 Cut out each leaf and tie to the stem of the wine glass with gold twine. I used copic markers to color all these images. 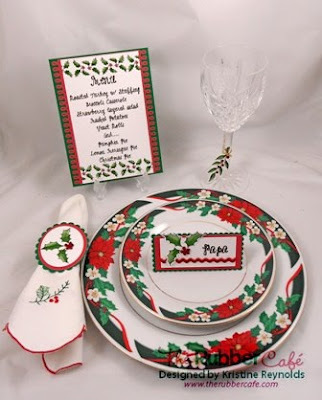 As you can see the Holly Berry Red Jelly Dots are perfect for the berries in this set. I hope this helps get your creativity jump started so that you can create beautiful table settings for your holiday table! Clean and Simple Christmas Tidings! This week Melissa challenged us to make clean and simple cards with her images. Your holiday cards don't need to take hours!!! This is a quick and easy variation of the glitter and acetate technique that I usually do. 1. 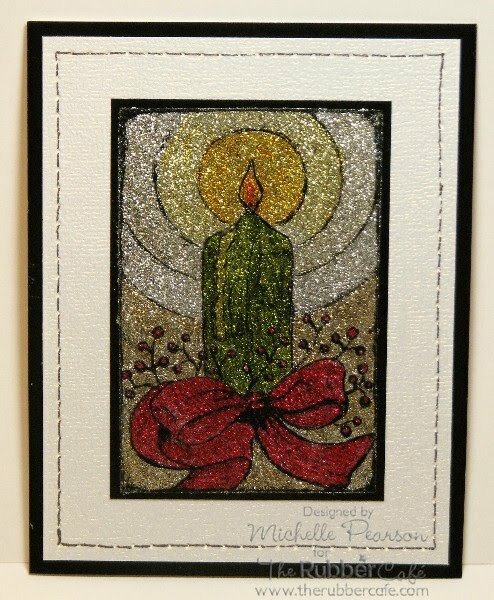 Stamp the candle image with stazon on acetate. 3. Cut out and run image (face down) through Xyron machine. 4. Cover it with silver glitter. I had to whip this little guy up in a hurry, it's been a very busy week for me and I didn't have the time to create anything earlier on. Hope you have been enjoying everyone's CAS cards this week. I know I have, they've been beautiful. Hi All and Happy Saturday!!! By now you know that this weeks theme here at The Rubber Cafe is Clean and Simple, which I must admit that I struggle with. 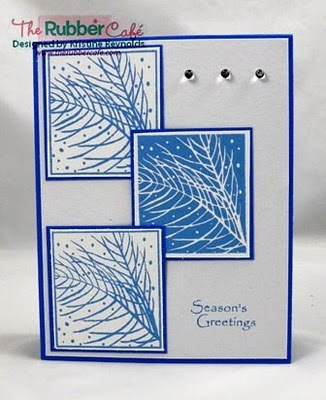 I am just not always a CAS stamper, but with this new set from The Rubber Cafe called Warm Wishes it is so easy to make a quick and simple card. For today I chose a black and white color scheme but honestly, I love the layout of this card and I think I may replicate it in different colors. 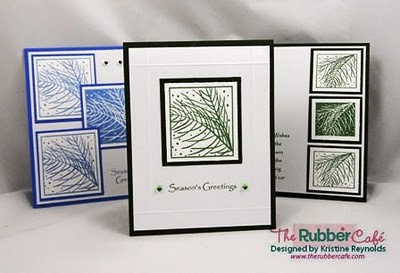 It would be great, just change out the ink and designer paper and you have a simple format to bang out all of those holiday cards you need to make. 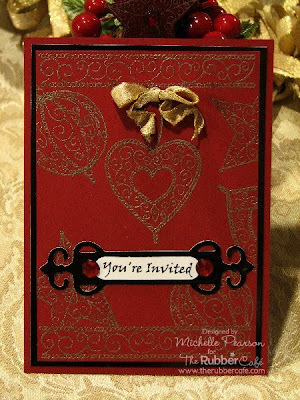 My dp used for todays card is from DCWV and the rest of the embellishments were in my stash. Hope you are enjoying all the wonderful cards that have been posted. We would love to hear your comments. Please leave the girls some love and let us know what you think. Have you seen all the great new Holiday sets at The Rubber Cafe? We showed you lots of samples using some of the new Jewish sets last month. Now it's time to showcase the new Christmas sets! This set is called "Warm Wishes". It is a terrific set for making quick, "Clean & Simple" cards that your friends and family will think took you forever!!! Here's a close up look at the cards I made. I am addicted to those sparkly Jelly Dots! They make CAS cards really stand out! I hope you've enjoyed my cards today and have gotten a little inspiration to get going on your Christmas cards too! I'm sitting here listening to the rain off the roof of the back porch. It sounds lovely considering normally this time of year it's hot and dry. Every once in a while I jump from the sound of thunder. Hasn't happened in a while...so maybe that part of the storm has passed. It's this kind of weather that reminds me the winter holidays are just around the corner. We'll all be going to holiday parties, entertaining, gift shopping and many other winter activities. 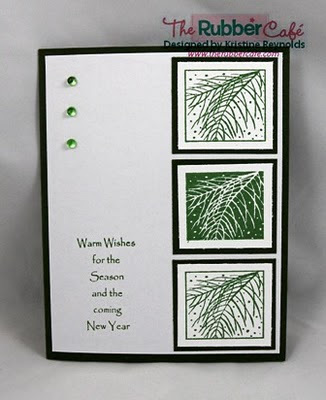 For those of us that make our own cards, our art gets put aside while we enjoy the winter months. We don't always have time to sit down and make that personal card. This card is something simple that can be done in a flash. A quick embossing and punch and you're on your way. 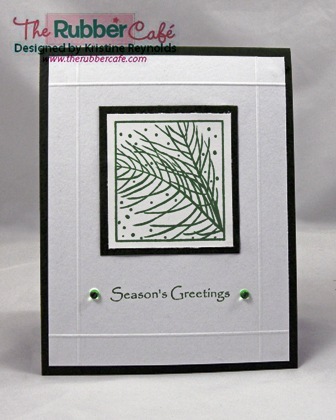 I used one of my favorites, the Swirled Ornament, for this card. 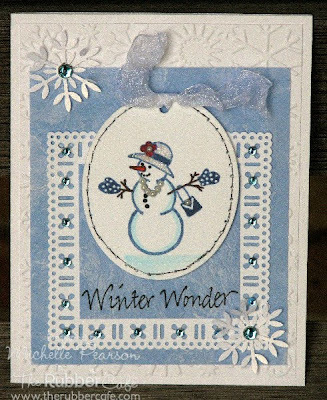 I embossed the background with one of the Winter Wonderland embossing folders and punched with a scalloped punch. On the bottom I scored 2 lines half inch apart and poped the ornament up. I really like the white on white look. The blue ribbon was tied using the bow maker part of the Ultimate from Crafters Companion. Hi all! Having a good fall so far? We had one of our first bad fall storms today. It has calmed down, but for a while I thought our house would actually move an inch or two. Best part of fall (except the beautiful colors) is that we’re getting closer to Christmas. I love making cards for the Holidays! And more than ever this year, cause the seasonal stamps from The Rubber Café is more awesome than EVER! Like the Christmas Tidings set. Check out this sentiment. It’s simply beautiful! 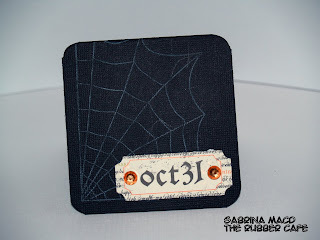 I stamped it and die cut it with Spellbinders Labels Fourteen – it’s a perfect fit with the medium sized die cut. 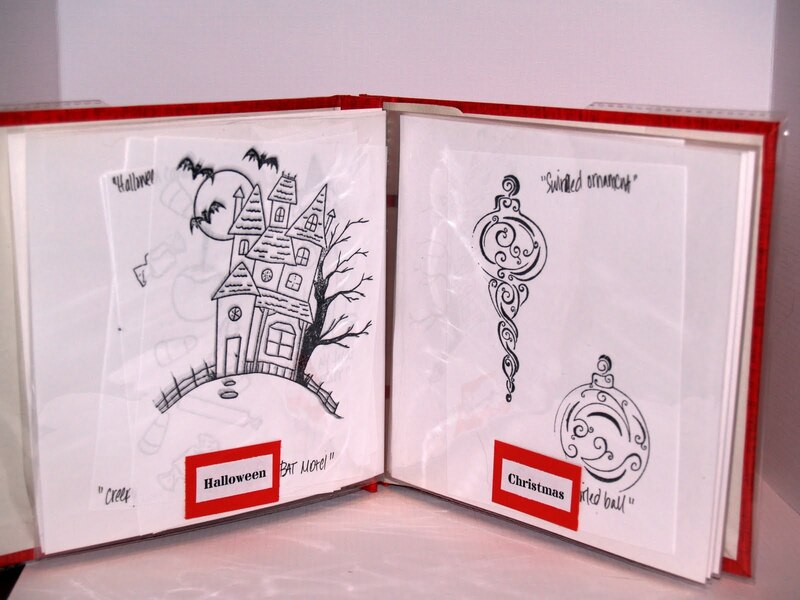 (Pssst, there is a Spellbinders Sale in the shop right now!!! check it out HERE). To get a perfect thin frame around the die cut, simply place the die cut on cardstock and outline the outside with a pen and cut out. Hey there is everyone getting ready for halloween yet??? I must admit I'm in the same category as Melissa. I LOVE LOVE LOVE Halloween but yet have no kids, rarely dress up etc etc etc but It's still my favorite holiday of the year. 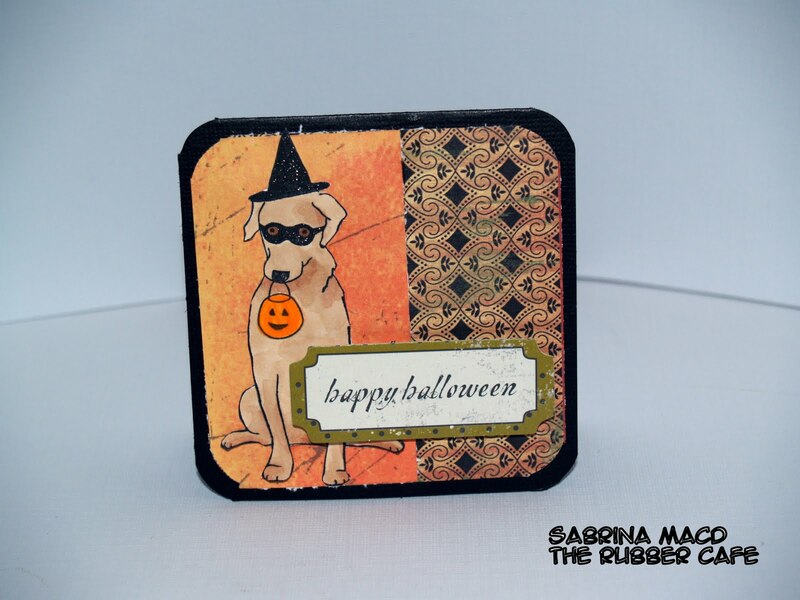 I thought I'd share with you today two little treats I've made up using the You Need to Dust stamp and the Wheres my Treat Labrador. 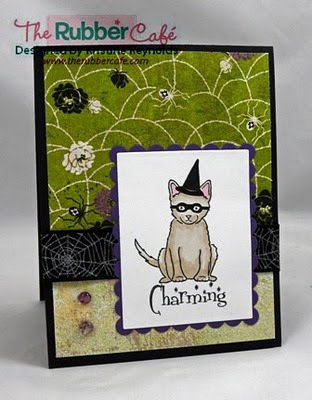 I stamped then embellished the cards using scraps of halloween products left over from previous years. The labrador I colored with Copics, cut and glued then popped up the sentiment. Hope you've enjoyed these little guys (3 1/4 x 3 1/4) I thought they'd be great for those special little ghouls that come over to trick or treat. Only two weeks left till Halloween. Did you get all your cards made and sent to all your little "goblins"? If not, I have a couple of cute, simple cards that you can get done and in the mail in plenty of time to delight! 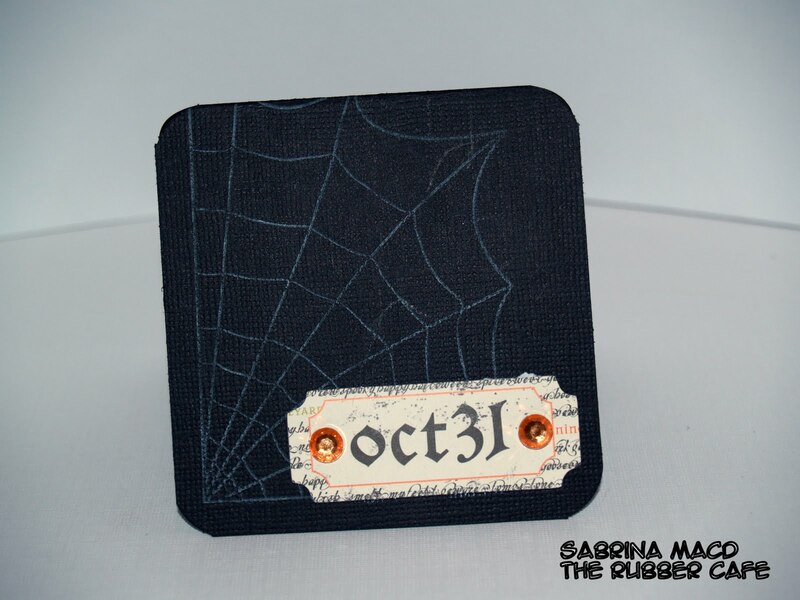 I embossed this skeleton three times on black cardstock. Then I adhered it to a white card, added a strip of ribbon (from Michael's) and stamped the sentiment in black ink. The bling is my new favorite embelishment, clear jelly dots. If you're picking up some of those you've got to get a "stick em up"! This is the best tool that you never knew you needed! Melissa sent it to me to use and I truly don't know how I lived with out it! It make dealing with tiny little embelishments soooo much easier! 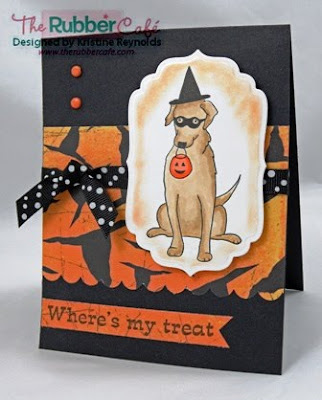 The second card was made with "Where's My Treat Labrador". The paper is by Remenisce, and the ribbon is by "Celebrate it", both from Michael's. I just love this adorable little kitty cat! the paper is from Basic Grey and the image & senitment are from "Charming Kitty". The ribbon is halloween ribbon from Michael's. 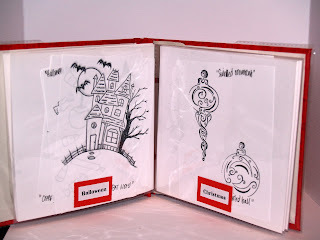 I hope these projects got you inspired to make some halloween cards! 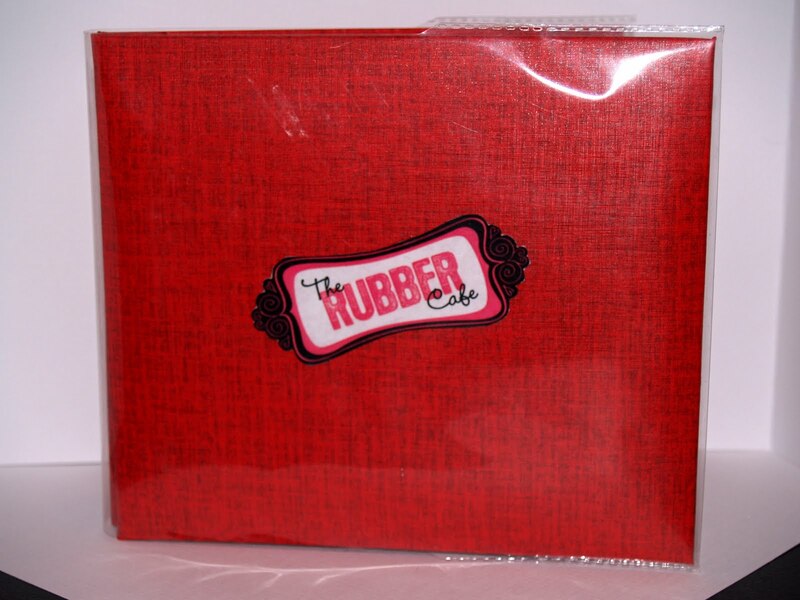 I'll be back next week with some terrific Christmas cards that I made with the newest sets from The Rubber Cafe! The last few weeks I have been fearlessly creating projects for a craft fair. The craft fair went very well. I had a great time and met lots of other crafters from around San Diego...not to mention...I was also able to put away a tidy little sum to help support my crafting habbit. Thanks to traveling with Melissa...setup went up without a hitch. 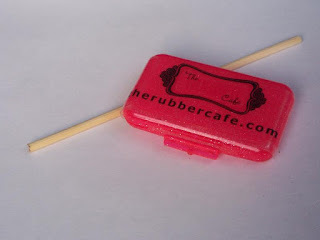 One of my hottest sellers was a cute little bag with individually wrapped bubblegum. I stamped the bubblegum machine on white pugnacious paper and colored each little gumball a different bright color. I corner chomped each corner and put it on a piece of red cardstock. I attached each tag to the bags with a piece of silver lined twine. The turnout was fair...but I had a good spot near the food venues where the kids were hanging out. They seemed attracted to the bright colors. Next thing I knew...I was all out of bubble gum. It's a good thing I took pictures before the show...otherwise I would be posting about something completely different. Did you know that your Copic Markers are refillable? We stock a wide variety of these refills along with replacement tips. 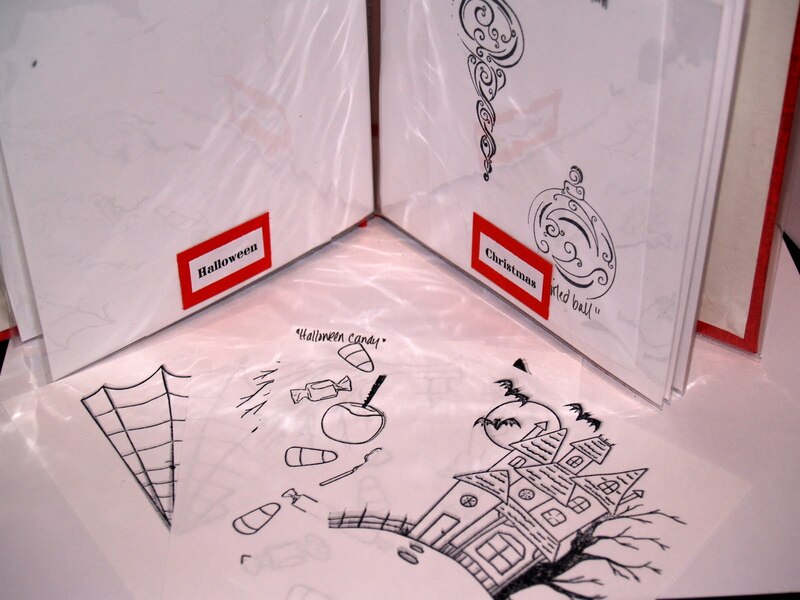 These refills will refill your Ciao markers over 13 times and also can be used on you Sketch markers. All refills in stock will be offered at this special price, get them while they last, limited quantities!!!! 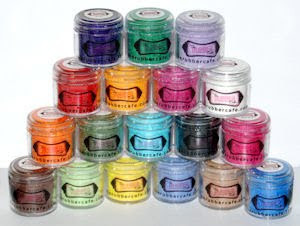 Be sure to order a variety of colors to add to your crafing supplies at this price!!! 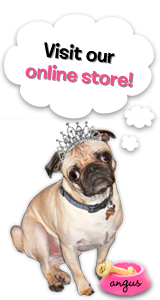 Demand for this item has made us extend the sale! 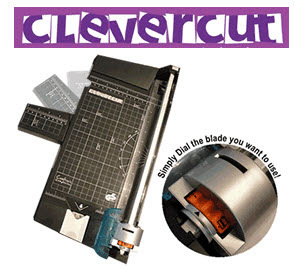 This is the same 5 in 1 Clevercut papercutter that you have seen advertised for much more. Well here is the big deal this week... you purchase $40 or more and we are going to send you 10 yards of a variety of high quality ribbons with a value of $15.00 or more . Happy Monday folks! I have a dragonfly card for you today. It’s an AMAZING dragonfly!!! Beautiful, right? It’s called Large Paisley Dragonfly. I stamped it on light blue patterned paper and clear embossed it. The embossing makes the image more stable so that I was able to cut all the details out without damaging the stamp. And it’s beautiful! LOL! When done, I adhered the dragonfly with pop dots for some dimension. I heat embossed the sentiment too. I hope your week will be a good one! Happy Saturday!!! 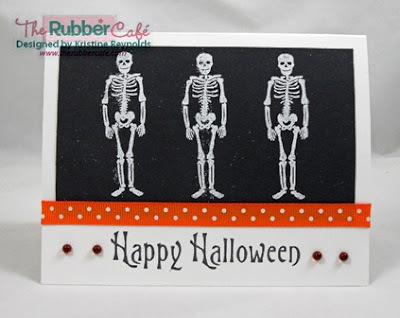 I have a card I made to share with you that uses a couple of new stamps from The Rubber Cafe. Let's say we call this "Hanukkah in a jar". 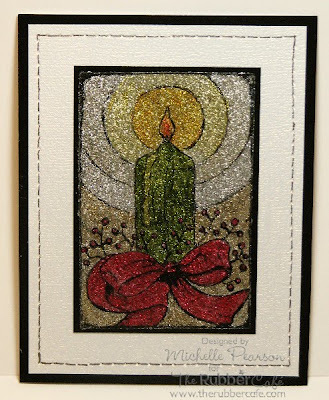 The stamp sets that I used to create this card is Basic Backgrounds 2, Celebrating the Festival of Lights, and Mini Jar. What I did today is stamp a bunch of the Jewish Stars onto white cardstock and cut them all out individually. I then stamped the bottom of my mini jar twice. Once onto white cardstock for the back of the jar, and once onto vellum paper for the front of the jar. I stamped the top of the jar onto white cardstock and used the background stamp to create the lines. Then I simply glued the vellum onto the cardstock around the perimeter and filled the jar with the stars, popped on the lid and there you have it. Alittle decorating later and some fun DP and viola!!! Hanukkah in a jar. This Mini Jar stamp can be used for sooo many different things. The options are endless!!! Thanks so much for stopping in today. We enjoy when you visit. Have a great day!! !